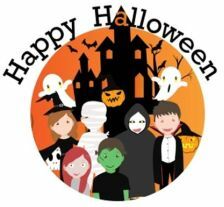 Read this article about Halloween safety and have students create posters or fliers to hang in elementary schools and local day care centers. In My High School FCS class we do a Great Pumpkin Cookie contest. Students make a Pizza sized Pumpkin chocolate chip cookie and decorate it using pastry bags and other items. We put them on a website and the whole school votes! !